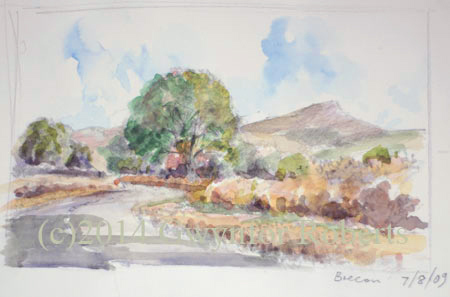 This is a small watercolour sketch done on the spot just outside the Brynich bridge and Brynich canal lock with just one of the Brecon Beacons visible. Along Victoria Road, Maesycwmmer. With Hengoed to Maesycwmmer viaduct. 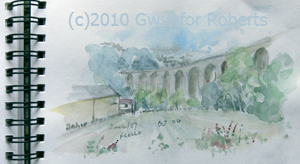 showing Hengoed viaduct from the Maesycwmmer side. 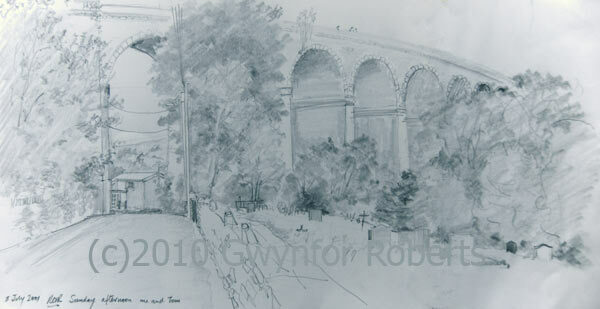 Top sketch on the above page is Hengoed viaduct in 1982. 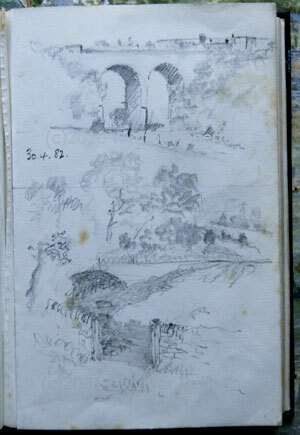 Bottom sketch is Cwmdu lane, maesycwmmer 1982, showing the remains of what was a stone bridge taking the Newport to Brecon train service - all long gone. Through the summer a few of the members from the Bargoed art Society gather for a sketching evening. This is one of the members homes and this is my effort for the hour and a bit we were there. Artist Tom Spencer - former Bargoed and district Art Society member. Another sketching evening with the Bargoed members this time at Penallta Park. Rather than look for a subject I found Tom painting away to his 'Arts' content ! This was nice enough for me - just a quick sketch. A dis-used railway bridge between Tredomen and Nelson. I've aquired a new bike, rather my sons throw away. Never the less it gets me about and I sometimes take a ride along the cycle path towards Nelson. Along the way there is this old bridge which crossed the railway line to nelson. A nice spot for a rest and some sketching. Earlier this year I spent a number of cold Sunday mornings sketching the church. This sketch is what I am using to complete the oil painting . 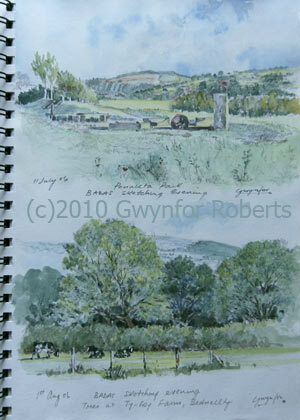 This sketch shows the road between Hengoed and Maesycwmmer. The road goes under the viaduct and this view shows the road as it exits on the Maesycwmmer side. 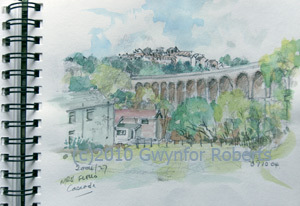 The painting of Hengoed Viaduct in Gallery 1 shows the road and bridge as it crosses over the Rhymney river.